Winged green peach aphids have a black head and thorax and yellow-green abdomen. Wingless adults and nymphs are usually pale yellow green including the cornicles (a pair of tubes near the tip of the abdomen) but may be pink. Adults reach 2 mm long. Aphids feed on leaves and excrete a sugary, sticky substance called “honeydew” which coats fruit and fosters growth of black sooty mold fungus. Green peach aphid overwinters in the egg stage on woody plants in the Prunus species, where nymphs feed in spring. Field vegetable crops are colonized in June by winged females who produce live young (nymphs), resulting in multiple generations of wingless females. Generation time from birth to reproductive adult is one to two weeks depending on temperature; each female produces 30-80 live young. If food quality declines, winged females develop and leave in search of new plants. In fall, both male and female winged aphids develop and return to woody plants to mate and lay eggs. The major damage caused by this aphid is the transmission of many different plant viruses; aphids are the most important vector of viruses in vegetable crops, and green peach aphid is a universal vector. It is also a pest in greenhouses. Besides spreading virus diseases, aphids in high numbers can cause economic damage by their feeding activities. Leaf curling and yellowing or deposits of honeydew on leaves or fruit can affect crop quality or yield. For this reason it is important to manage aphids even if viruses are not a concern. Numerous crop families (including solanacous crops, cucurbits, brassicas, spinach and chard, and carrot families) as well as broadleaf weeds support green peach aphid. Begin to examine plants in early July for aphids and the presence of beneficial species. Scouting across a field gives you an estimate of current numbers. If aphids are present, check back in a few days to see if the numbers are increasing or decreasing. Take note of which natural enemies are present. Check undersides of leaves, including lower and mid level leaves. Spray only when aphids are increasing and building up to high numbers. Treatment thresholds vary between crops - see below for specific thresholds. Treat at 5-7 day intervals. For more detailed information about scouting for aphids in specific crops, please see the Insect Management section of each of the following crops on the New England Vegetable Management Guide website - each crop name is linked to the appropriate page. Plant crops away from Prunus spp. (peach, wild cherry, etc.). Reduce areas of bare soil around or within the crop. Aphids find plant tissue based on the color contrast between the foliage and the bare ground, so if there is no bare ground the aphid cannot “see” the crop. Reflective plastic mulch repels aphids as long as 50% of the surface area is reflective. Even black plastic mulch has been shown to reduce aphid numbers compared with bareground culture. When spraying, coverage of underleaf surface is important. Add a spreader-sticker. Spray effectiveness may vary depending upon the aphid species present. Use selective products to conserve beneficials that suppress aphids. In fruiting crops (solanaceous crops, cucurbits, and beans), avoid using products that are toxic to bees during bloom, or treat in the evening after bees stop foraging. Systemic materials are generally the most effective insecticides available for aphid control, however if you are controling aphids as a means to control viruses in your crop, systemic materials are often ineffective and can even amplify virus problems in crops. Systemic insecticides are taken into the plant and become present in the plant juices. Aphids feed by sucking juices from the plant, and when they do so they also ingest some of the insecticide. 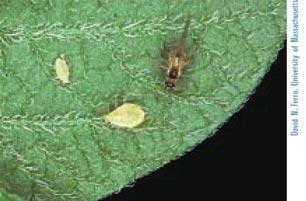 However, when just probing a leaf an aphid is not feeding and does not ingest plant juices or insecticide. In fact, the presence of an insecticide may actually stimulate probing and cause aphids to move from plant to plant in an effort to fine a suitable feeding site. This can increase the spread of nonpersistent viruses. For virus control, aphid repellants such as horticultural oils (especially early on when aphid populations are low and plants are young) and newer behavior modifying pesticides may be of use, including Assail, Belay, Admire Pro, Fulfill, Movento, and Platinum. Aphids are usually controlled on peppers by natural predators and parasites, such as lady beetles, lacewings, spiders, syrphid fly larvae, wasps, and beneficial fungi, unless the populations of these beneficials are disrupted by chemical sprays. Preserve natural enemies by using selective/microbial pesticides for other pests whenever possible. Occasionally green peach aphid (GPA) or, less commonly, melon aphid (MA) and potato aphid (PA) populations build up and require controls. Early-season, broad-spectrum sprays will destroy beneficials and lead to aphid population buildup.